They are the few, the proud, the tech companies that have gone public this year. Acacia Communications is one of them. The Maynard, MA-based networking company (NASDAQ: ACIA) raised $103.5 million in its IPO in May. That remains the Boston area’s only tech IPO of 2016. Meanwhile, San Francisco-based software firm Twilio went public in June, raising $150 million. And Redwood City, CA-based Talend, a data-integration software company, had a $95 million IPO last month, as did Seattle-based Impinj, a radio-frequency identification tech company, which raised $67 million. Acacia’s first quarterly report as a public company is expected Thursday. So it seems natural to ask whether the firm has much in common with other recent-IPO companies. Acacia is also different from most newly public tech firms in that it has been profitable for the last two years (what a concept). The company reported profits of $13.5 million and $40.5 million in 2014 and 2015, respectively, on revenues of $146.2 million and $239 million. Acacia’s stock is currently trading at around $69 a share, which is triple its IPO price of $23. The company had 228 employees as of the end of the first quarter. In a recent interview, Shanmugaraj couldn’t comment on Acacia’s latest financial performance, citing the company’s SEC-mandated quiet period, but he shed light on some lessons learned from 30 years in the telecom industry, as well as his company’s strategy in optical communications—and why it’s important to the broader tech world. Acacia was founded in 2009 by Benny Mikkelsen, Christian Rasmussen, and Mehrdad Givehchi. The trio of engineers collectively had experience from Bell Labs (previously owned by Alcatel-Lucent), Mintera, and Sycamore Networks. Shanmugaraj joined Acacia in early 2010. He says he first met the founders over an espresso at the firm’s offices, in a building once occupied by Digital Equipment Corporation. Shanmugaraj, who goes by “Raj,” provided a business spark. He was coming from Alcatel-Lucent, where he had been vice president of business development in the optical networking division. Before that, he was CEO of Astral Point Communications, which was bought by Alcatel in 2002. Shanmugaraj bonded with the Acacia founders over their experiences in telecom—and their vision for the new company. 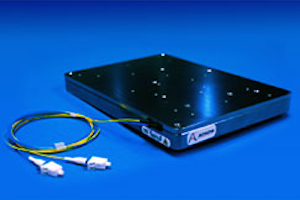 Acacia saw an opportunity to “siliconize” optical communication systems—meaning bring the benefits of the silicon chips at the heart of computers and electronic devices to the field of photonics. The idea was to make optical interconnect equipment (such as line cards and circuit boards) faster, smaller, more energy-efficient, and easier to build. The applications could be in everything from big telecom providers’ networks—think Verizon and AT&T—to Web infrastructure companies like Amazon and Google and their ever-growing data centers.